The Healthy Cooking Team have been working with the Men’s Good Grub Club and this is one of their favourite recipes. Sift flour, baking powder, salt and cayenne pepper into a large bowl. Add the cheese and mix through the flour mixture. Beat the egg and milk together in a separate bowl and add the oil. The oil replaces the butter/margarine which is usually used for scones. Pour the milk/egg/oil mixture into the flour mixture and using a metal spoon or fork, mix the dough until it clumps together, but is not too dry. If too dry, splash a bit more milk in to use up the flour. Press the dough out on a flat clean floured surface until it is about 5mm thick, then fold it over on top of itself (this gives the finished scones the natural “break” to cut open), flatten it again, using the palm of your hand. Do not use a rolling pin as it is too heavy and will prevent the scones from rising. 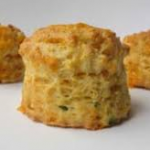 Cut out your scones by using a round cutter (you decide on the size) or if you don’t have a cutter handy use a drinking glass. Place them on a backing tray and pop them in the oven at 180c for 15 to 20 minutes. Service with butter whilst still warm. This entry was posted in Recipes on March 18, 2019 by rachael.